Fermaid K is a blended yeast nutrient adapted to the fermentation of beer wort. 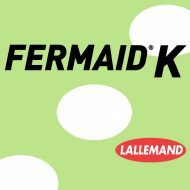 Proper use of Fermaid K reduces the occurrence of sluggish and/or stuck fermentations. No urea is used anywhere in the production of Fermaid K.
In all fermentations yeast growth must take place before the anaerobic or alcohol fermentation can begin. In most beer applications, the common active dried yeast inoculation (when yeast is added to wort) is 100g/hL, twice the amount for lagers, which results in an initial cell concentration of six to ten million viable cells/mL of wort. Under normal conditions, the cell population will increase to 100 to 150 million viable yeast cells/mL before growth stops and alcohol fermentation takes over (stationary phase). Because of this significant increase in biomass, adding Fermaid K to the wort ensures that proper balance of nutrients are available to the yeast during this critical growth phase. Without proper nutrition, the risk of sluggish or stuck fermentations increases. These sluggish or stuck fermentations are microbiologically unstable and can lead to the growth of undesirable organisms that can result in unwanted by-products. Improve rehydration, inoculation or fermentation temperature management. Nutrient defeciencies, including oxygen. Variability in raw materials. 1. Usable nitrogen (ammonia salts and amino acids). 2. Thiamin, folic acid, niacin, and calcium pantothenate. For normal applications, the recommended addition rate of Fermaid K is 25 grams per 100 liters. Fermaid K should be dispersed (stirred) into the wort just prior to pitching the yeast.